IMPORTANT: We have 3 bedrooms - 2 with Queen Beds & 1 with a Single Bed. You will be allocated sufficient bedrooms to accommodate your party but bedrooms that are not required will be locked. 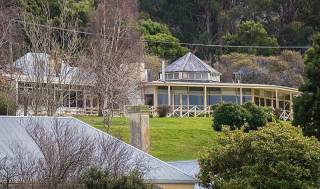 Burilda Waters tranquil waterfront setting is ideal for relaxing and exploring the Tasman Peninsula. Burilda Waters is perfect for a romantic holiday or for a relaxing family vacation. 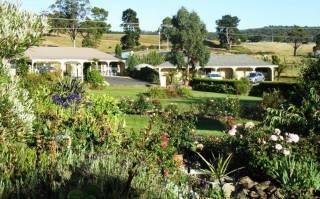 We provide quality fully self contained accommodation on Possum Beach at Port Arthur. This two story house has panoramic ocean views of the beautiful Carnarvon Bay and the Isle of the Dead. The main bedroom is upstairs and sleeps two in a queen size bed. Downstairs there is a second lounge area, separate bathroom and toilet and two bedrooms. One contains a queen size bed and the other a single bed. It is a great place to relax, unwind and enjoy the many tourist attractions, walks and restaurants located on the Tasman Peninsula. The PORT ARTHUR HISTORIC SITE is located within walking distance from Burilda Waters along a picturesque coastal track. Entry to Burilda Waters is via an electronic keypad on the front door. The code changes for each guest. After you have made your booking we will contact you and send you a confirmation email with your entry code and other details. If you do not receive the confirmation within 48 hours please contact us via email or phone. As access is automated, you can arrive at any time after 2:00PM. Check out is before 10:00AM on your departure day. Smoking is not permitted inside the building and pets are not accepted. Guests are required to supply current email and telephone contact details. All pricing is based on a 2 person double. The use of separate bedrooms incurs an additional cost. All non required bedrooms will be locked. A cot and high chair are available at no extra cost. Access to Burilda Waters is via an electronic keypad and the code changes with each guest booking. As entry is automated you can arrive any time after 2.00pm and check out is before 10.00am on your departure day. Payment must be made by EFT into our nominated bank account or by cheque. We will contact you soon after you have made your booking and you must respond within 48hours. Full payment must be made at least two weeks prior to arrival. Failure to comply with the conditions above may result in your deposit to Wotif being forfeited and your booking cancelled. We can be contacted via the details located on your booking confirmation. The deposit paid to Aura Travel is non-refundable. If you cancel your booking, 50% of the total booking amount will be forfeited. We will re-advertise your booking dates and refund your money for any days re-booked. We do not require a security bond. However, you are prohibited from giving your Access Code to any other person who is not staying with you at Burilda Waters. Please do not divulge your access code to anyone, as you will be held liable for any loss incurred as a result of such action. Directions to Burilda Waters Safety Cove Road Port Arthur: Follow the Arthur Highway to Port Arthur. * 600 meters past the turn off to the Port Arthur Historic Site, * turn left down Safety Cove road (Signpost - Remarkable Cave). * Burilda Waters is located on the right 1.80 km from the turn off. The beautiful Tasman Peninsula has many attractions and is equality suited to the outdoor adventurer; those who enjoy a quiet stroll on the beach, and those who enjoy exploring historic ruins such as at the Port Arthur Historic Site; the Coal Mines Historic Site (past Premadeyna approx 28km from Port Arthur) and the Dogline at Eaglehawk Neck. There are numerous spectacular walks with ocean views in the area.